..... Click the link for more information. ). Tetracycline may cause permanent discoloration of developing teeth, and it is not given to pregnant and lactating women and growing children. Because of the development of strains of microorganisms resistant to the tetracyclines, these antibiotics have lost some of their usefulness. Aureomycin is a trade name for the derivative chlortetracycline, and Terramycin is a trade name for oxytetracycline. Omadacycline (trade name Nuzyra) is an antibiotic derived from tetracycline that has been chemically altered to block bacterial resistance. any of a group of natural and semisynthetic antibiotics of similar chemical structure and biological action. In terms of chemical structure, tetracyclines are a tetracyclic condensed system with various substituents. Preparations obtained by the chemical modification of natural tetracyclines, as well as semisynthetic derivatives of tetracycline, are also used in medicine. Examples of the first group are Reve-rin, morphocycline, and glycocycline; among the members of the second are methacycline hydrochloride (Rondomycin), doxycycline (Vibramycin), and minocycline. Tetracyclines are broad-spectrum antibiotics. They inhibit the growth of gram-positive and gram-negative bacteria, spirochetes, leptospires, rickettsiae, mycoplasmas, several protozoans (amoe-bas and trichomonads), and large viruses of the psittacosis-lym-phogranuloma and trachoma groups. They are inactive or only slightly active against Proteus, Pseudomonas aeruginosa, Mycobacterium tuberculosis, and most fungi and small viruses. The bacteriostatic action of tetracyclines results from the repression of protein biosynthesis in the bacterial cell. The development of resistance to one of the tetracyclines is accompanied by resistance to all other tetracyclines except minocycline. Preparations combining tetracyclines with antibiotics having a different mechanism of antimicrobial action, such as oleandomycin, are used to prevent the propagation of strains resistant to tetracycline. Tetracyclines are used for the treatment of diseases of the respiratory organs and the gastrointestinal, urinary, and biliary tracts, as well as infections of the soft tissues, epidemic typhus, and other diseases caused by microorganisms sensitive to these drugs. Tetracyclines are effective in infections caused by microorganisms that are resistant to other antibiotics. Chernukh, A. M., and G. Ia. Kivman. Antibiotiki gruppy tetratsiklinov. Moscow, 1962. Barton, D. H. R. “Novye puti sinteza tetratsiklina.” Zhurnal Vses. khimicheskogo obshchestva im. D. I. Mendeleeva, 1971, vol. 16, no. 2. Navashin, S. M., and I. P. Fomina. Spravochnik po antibiotikam, 3rd ed. Moscow, 1974. Finland, M. “Twenty-fifth Anniversary of the Discovery of Aureomycin: The Place of the Tetracyclines in Antimicrobial Therapy.” Clinical Pharmacology and Therapeutics, 1974, vol. 15, no. 1. Any of a group of broad-spectrum antibiotics produced biosynthetically by fermentation with a strain of Streptomyces aureofaciens and certain other species or chemically by hydrogenolysis of chlortetracycline. C22H24O8N2 A broad-spectrum antibiotic belonging to the tetracycline group of antibiotics; useful because of broad antimicrobial action, with low toxicity, in the therapy of infections caused by gram-positive and gram-negative bacteria as well as rickettsiae and large viruses such as psittacosis-lymphogranuloma viruses. Degradation and inactivation of tetracycline by TiO2 photocatalysis. 05) between DD and MIC for the resistance to streptomycin and tetracycline was reported (Table 1). It has been found that within 5 months, tetracycline in a liquid fertilizer undergoes degradation by 50% (Winckler and Grafe, 2000). One hundred ans six patients out of 204 (52%) had received oral azithromycin and 98 patients out of 204(48%) had received topical tetracycline. In this case a synthetic bioactive graft material was combined with resorbable tetracycline fibers as a treatment procedure after enucleation of the cyst. Fluorimetry  electrochemical method  liquid chromatography  capillary electrophoresis  and chemiluminescence  have been reported for determination of tetracycline. 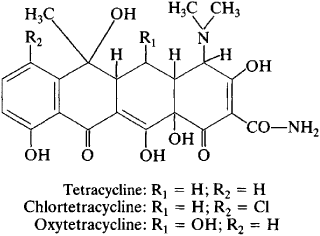 In vitro synergistic effects of baicalin with oxytetracycline and tetracycline against Staphylococcus aureus. IZDs more than or equal to 14, 15, 17 and 20mm were considered to be susceptible to Amoxicillin, Metronidazole, Tetracycline and Clarithromycin, respectively. Three strains were resistant to ceftriaxone while four were resistant to tetracycline and ciprofloxacin simultaneously by the disc-diffusion method (Table 3). In addition, the MaxSignal[R] Oxytetracycline ELISA Kit, the MaxSignal[R] Chlortetracycline ELISA Kit and the MaxSignal[R] Doxycycline ELISA Kit were launched to facilitate the screening of specific tetracycline antibiotic in a variety of food samples. A 2006 RCT randomized 290 patients to the macrolide azithromycin (500 mg daily for 3 consecutive days a week in the first month, then 250 mg every other day for 2 months) or tetracycline (1 g daily for 1 month, then 500 mg daily for 2 months). This means that ICSP cells can only produce v-Myc when the researchers add a compound called tetracycline to laboratory cultures. The new cells on the block: "induced conditional self-renewing progenitor cells"